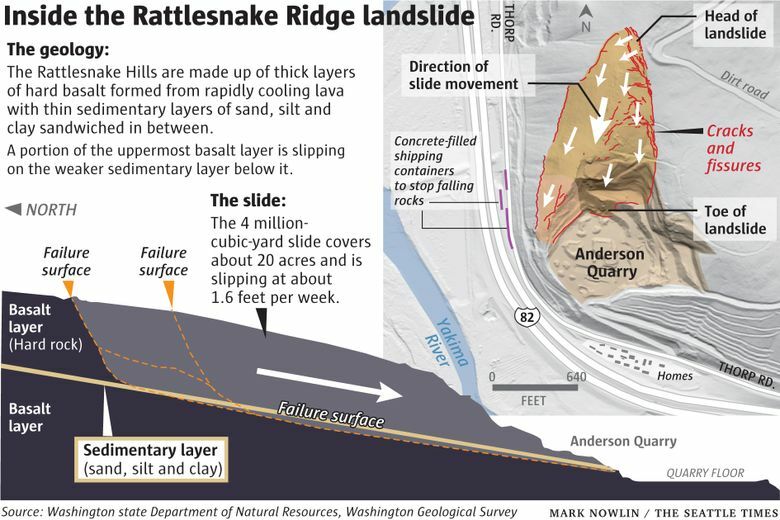 Landslide watch: Can experts predict collapse at Washington’s Rattlesnake Ridge? More than 100 instruments are monitoring the slope’s every twitch and should provide some warning before the 8 million-ton mass lets loose. While Las Vegas bookies aren’t laying odds — yet — on when the landslide at Rattlesnake Ridge will let loose, engineers and geologists tracking the treacherous slope near Yakima are placing their bets on mid-March to early April. But what are the chances they’ll be right? And is it even possible to predict when an 1,800-foot-tall ridge will come tumbling down? There’s a lot riding on the answers. 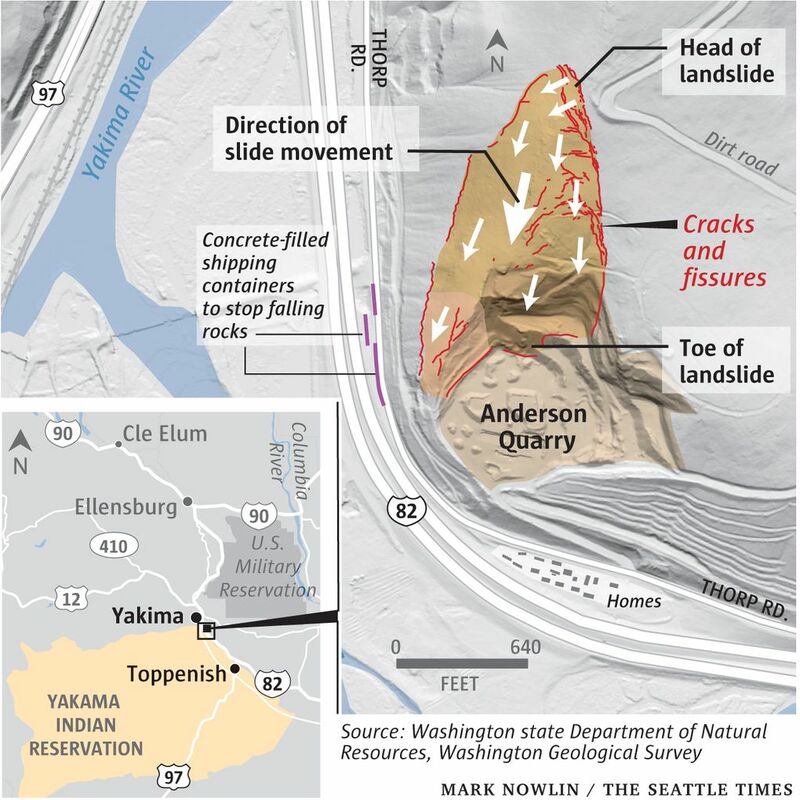 The impending, 8 million-ton slide looms over Interstate 82, a rail corridor and the Yakima River. Residents of a cluster of homes at the base of the ridge have evacuated to motels, with no idea when they will be able to return. 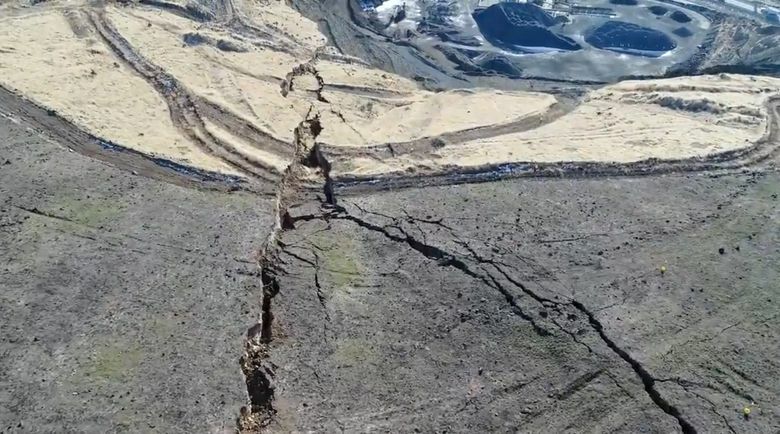 Since cracks were spotted on the hillside near a quarry in October, the area has been swarming with state, local and tribal officials, as well as consultants hired by the pit operator. Their landslide forecasts are cautious, hedged with warnings that the collapse could come earlier. But the approach being used has a solid track record, particularly in the mining industry. It’s based on blanketing a hillside with instruments to measure the rate of slip, then extrapolating from the trend. “This is a blunt instrument, but it’s tested and it has worked on slides before,” said University of Washington geomorphologist David Montgomery, who has been following the situation at Rattlesnake Ridge but isn’t directly involved. 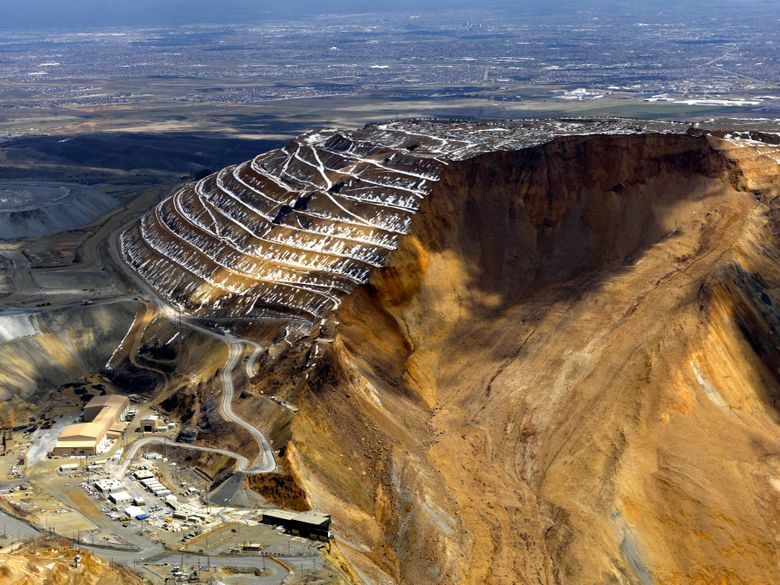 One of the method’s biggest successes came on April 10, 2013, when the operators of Kennecott’s Bingham Canyon mine near Salt Lake City hustled their crews out of the pit in the morning and announced that a slide was imminent. Hours later, a towering wall collapsed in one of the biggest nonvolcanic landslides in North American history. In Switzerland, years of monitoring in a steep valley paid off in 2012 with several days’ warning before a series of catastrophic slope failures. 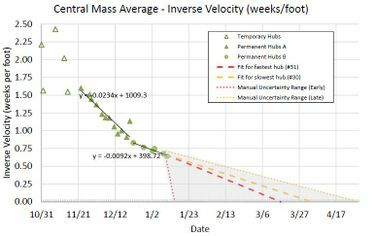 In another mining incident, the failure date was accurately forecast three months in advance. The method works because of the way many landslides unfold, said University of Utah engineering geologist Jeffrey Moore. As a slope cracks and begins to slide, the forces holding the mass of soil and rocks in place weaken and the underground surface the mass is sliding on — usually a weak layer of soil — gets slicker. As a result, the mass gains momentum and starts to slide even faster. Gravity eventually overcomes friction, and the slope collapses. “There’s enough case histories behind the method that when the data look right and you are able to identify trends, you can accurately predict the time of failure,” Moore said. On Rattlesnake Ridge, data is pouring in from multiple types of measurements that including GPS readings, automated laser surveying stations, seismometers, ground-based radar and a laser scanning technique called LIDAR. More than 100 instruments are sitting on, or aimed at, the hillside. 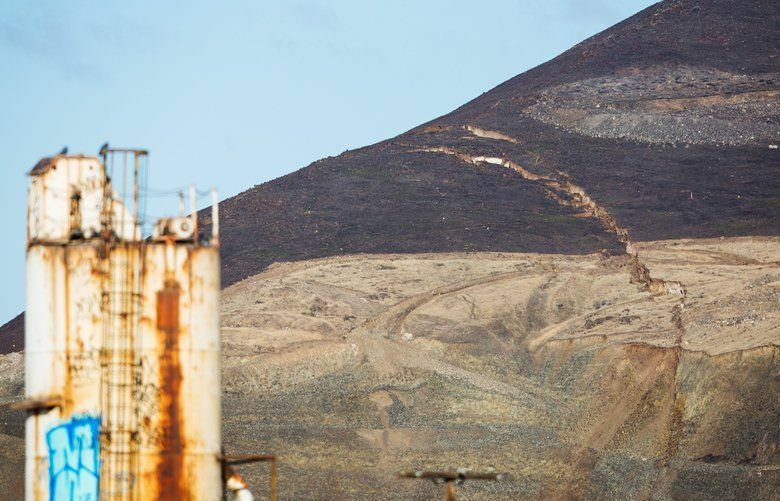 When monitoring started, the 20-acre slide mass was moving an average of a foot a week. It has since sped up to about 1.6 feet per week, but the acceleration hasn’t been constant. The rate of movement in December pointed to a major slide by mid-January. The date was pushed back to mid-March when the acceleration slowed this month. The target date could well shift again if the slope speeds up or slows down. “Slides are very dynamic environments and you have to constantly reassess them,” said James Struthers, chief engineering geologist for the Washington State Department of Transportation (WSDOT). The forecast method isn’t foolproof, cautioned Rex Baum, a landslide expert at the U.S. Geological Survey. Sometimes, slopes that seem to be on the verge of collapse stall out instead. “That can be a frustrating situation to deal with,” he said. Eventually, the slide will start moving again, but it could be weeks, months or even years. And being able to predict when a slide is likely to occur isn’t the same thing as being to able to predict how a hillside will collapse, Baum said. The latter depends largely on the detailed geologic structure of the hill, which can be difficult to discern from superficial measurements. While Kennecott was able to pinpoint the time of the Bingham Canyon slide, the immensity was a shock. Millions of dollars worth of equipment that had been moved to an area deemed safe was pulverized. The 2014 Oso landslide in Snohomish County, which killed 43 people and buried an entire community, stunned geologists with its reach, speed and ferocity. That slide struck on a rain-soaked hill composed of glacial sediments that had slid repeatedly in the past. Rattlesnake Ridge is mostly made up of sturdier basalt, and water doesn’t seem to be a factor in the evolving slide. But big landslides can travel fast and far even without water, as the Bingham Mine collapse showed, Moore said. “We have seen many past cases where large, dry rock slides fail catastrophically,” he said. State officials believe that’s unlikely at Rattlesnake Ridge. So far, the slide has been creeping slowly down a slope of about 15 to 20 degrees. It appears to be slipping on a weak layer of sedimentary rock. The most likely outcome is that the slide will continue to move slowly, with much of the 4 million cubic yards of rock and soil spilling into the quarry pit at the base of the hill, according to Cornforth Consulting, the geotechnical engineering firm hired by quarry operator Columbia Asphalt and Ready-Mix. Moore describes that as an “optimistic” scenario and says it’s important to plan for the possibility of a catastrophic failure. “If the thing fails all at once, it’s well within the range of possibility that it could hit the highway,” he said. If the slide slumps in stages, then the potential for damage is likely to be lower. An independent geologist who raised concerns about the west side of the slope collapsing and spilling across the highway and river said he’s less worried now that continued monitoring has shown the 200-foot-deep cracks on the top of the hill are not extending to the north. “I’m reassured by that, but I still believe a lot of things could happen that we don’t expect or haven’t predicted,” said Bruce Bjornstad. Washington Department of Natural Resources (DNR) officials say they are planning for a range of scenarios, including a worst-case situation similar to the one Bjornstad outlined. Yakima County and the town of Union Gap issued emergency declarations, and local officials are gearing up to respond if the slide spills into the Yakima River, said Yakima Valley Office of Emergency Management Director Jeff Emmons. To keep a closer eye on the hillside’s western flank, which has few instruments, WSDOT recently launched twice-weekly laser surveys. So far, they’ve measured about 5 feet of bulging compared with images from 2015, Struthers said. That’s not surprising and doesn’t raise any alarms about a major failure in that area, he added. State agencies and Cornforth Consulting are developing run-out models that show how far and in which direction the slide could travel under different scenarios, said State Geologist Dave Norman, of the DNR. And last week, DNR and WSDOT hired an independent contractor, Wyllie & Norrish Rock Engineers, to analyze the monitoring data, observe the slide and provide a second opinion.